The project that got me started. I got into woodworking full-bore when I couldn't find an entertainment center I liked well enough to buy. I built a matching aquarium stand first, just to get my feet wet. 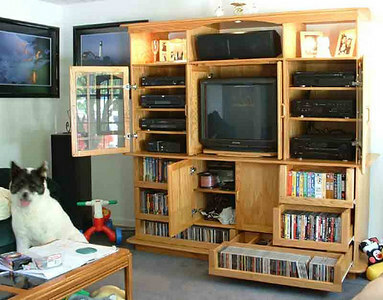 This piece was built in 2000, and I sold it in 2005, when I outgrew it (as in upgraded to a much larger TV). For only holding a 27" TV, this piece was a beast. It broke down into two major pieces, and all of the doors were on quick-release "european" hinges. The drawers, of course, came out as well. Nonetheless, it was a bear to move! 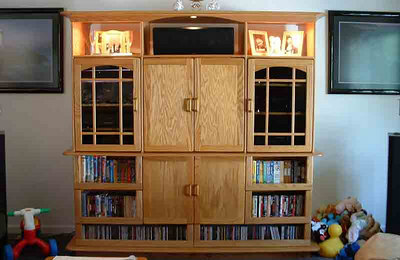 This was built with red oak and red oak-veneered plywood, all bought from a big box store. After this project, I quickly figured out what a waste of money it is to buy hardwood lumber from Lowe's, Home Depot, etc. This was the first of many shadow boxes I made. 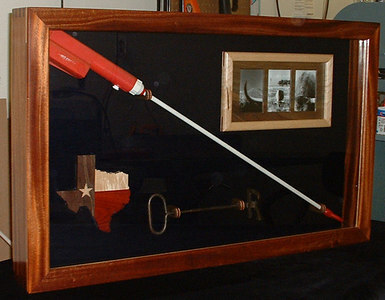 The case and face frame are curly maple, and the splines and flag holder are cherry. 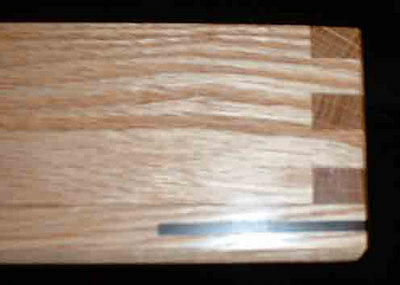 The second box was similar in design to the first, but the "client" wanted to use oak with walnut as a secondary wood. 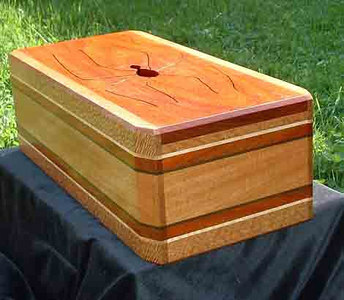 This box is curly maple and cherry as well. 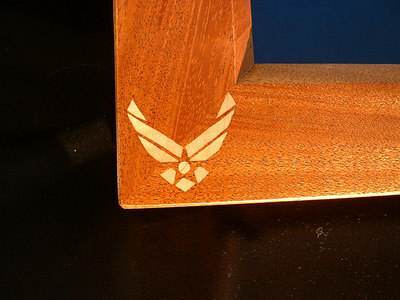 I added the glass etching of the Air Force logo and a strip of cherry around the inside of the frame. 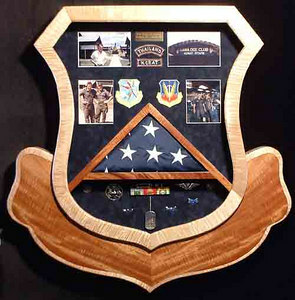 Here is a shadow box built for a friend of the family. 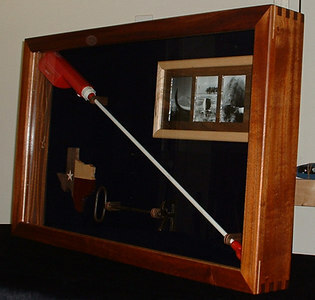 Her father raised cattle, and this cattle prod and branding iron were always in his truck. 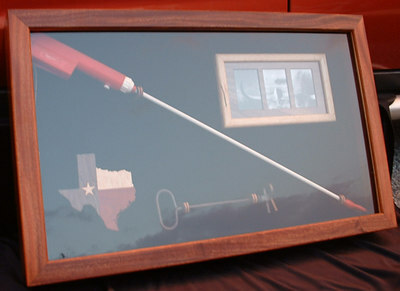 I added the Texas silhouette and framed pictures to take up space. 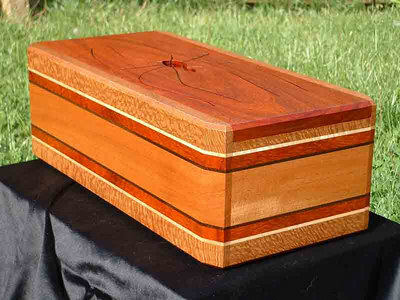 The case is african mahogany with maple splines and a maple strip inside the frame. 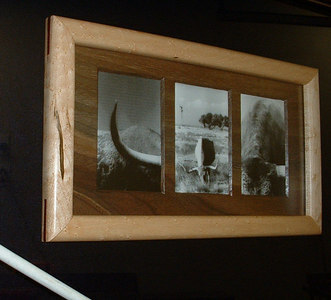 The internal frame is birdseye maple with walnut-splined corners and a walnut "mat" framing the individual photos. 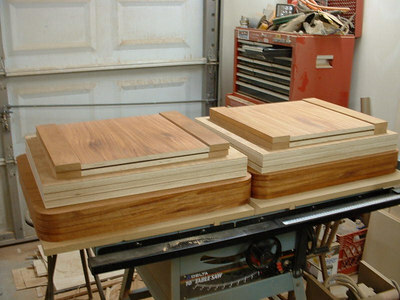 The clamps that hold the prod and brand are laminated walnut, maple, and bloodwood (satine). 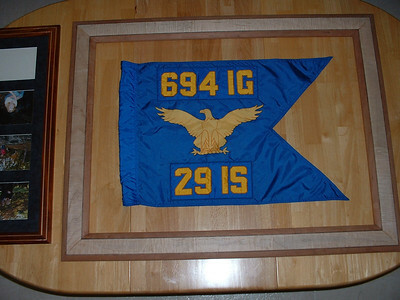 This was the first project I cut out on my wife's new scroll saw (a 20" RBI Hawk). That was a major step up from the delta saw. The woods are walnut, curly maple, birdseye maple, and bloodwood. 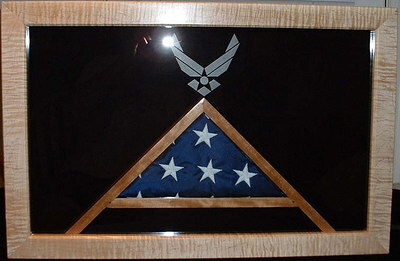 The flag in this case was flown in an F-15 during Operation Iraqi Freedom. 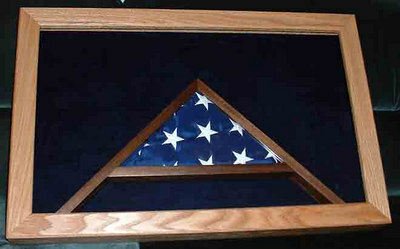 The case is mahogany, and the flag frame is lacewood. 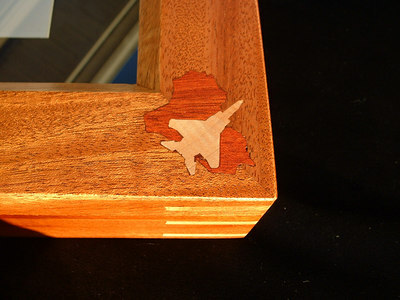 The inlays and splines are maple (the inlaid silhouette of Iraq is bloodwood). 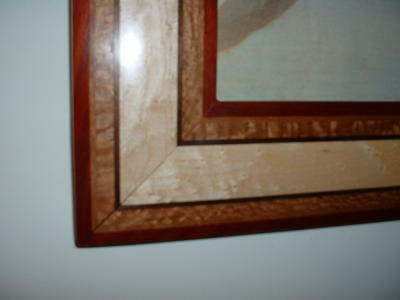 There is also a certificate that was later placed inside the frame. 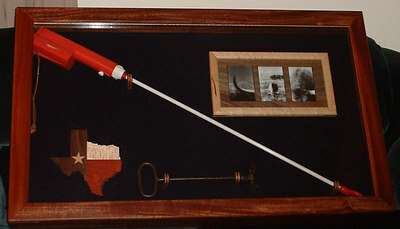 This tongue drum was made from scrapwood for something to do. A coworker asked me if I had ever heard of a tongue drum. Until then, I hadn't. 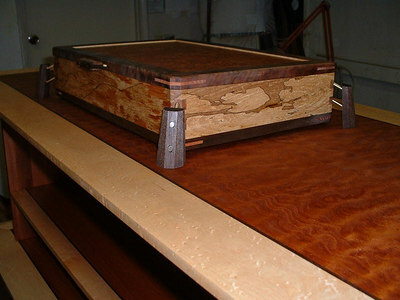 The woods used were padauk, lacewood, maple, peruvian walnut, and mahogany. 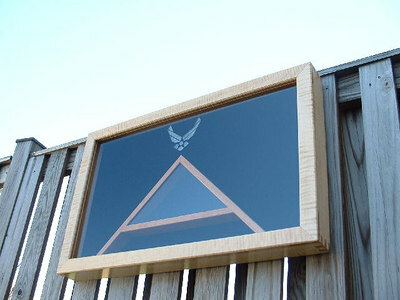 This is a picture frame I built for my daughter's room. I bought the picture in Venice, Italy when I was in Europe for a TDY. 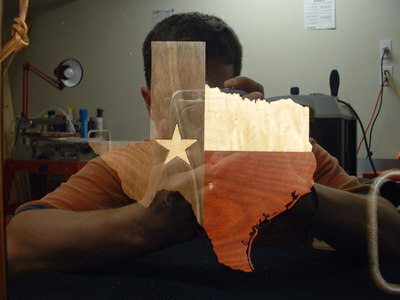 The woods are bloodwood, cherry, lacewood, peruvian walnut, and birdseye maple. 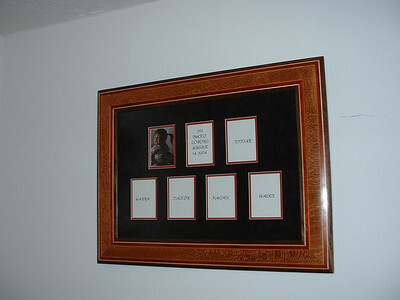 I built this frame as a Christmas gift for my mother, to hold pictures of all of her grandchildren. 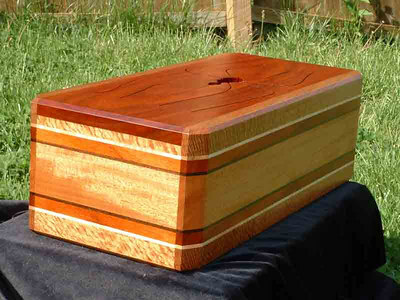 The woods are maple, black walnut, padauk, cherry, and lacewood. 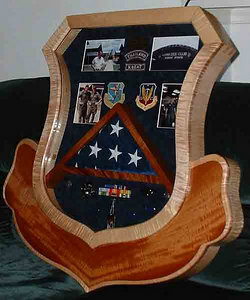 This was a going away gift from our squadron to an outgoing commander. 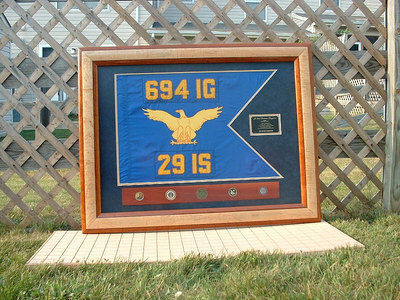 The 694th IG went away shortly before her change of command. 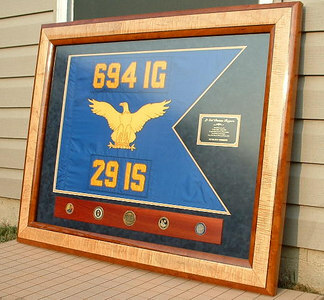 We framed the old guidon, since it was retired. 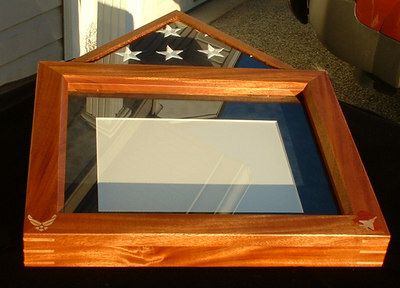 The frame features cherry, peruvian walnut, and curly maple. The coin rack is bloodwood. Here is the frame in-progress. 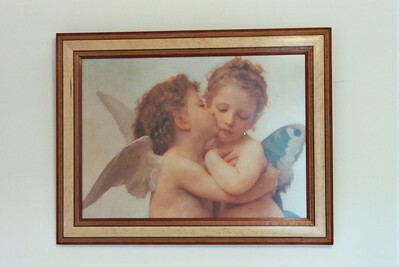 Note the frame next to it (not entirely in the picture). I've made ten similar frames so far for all of our favorite pictures. 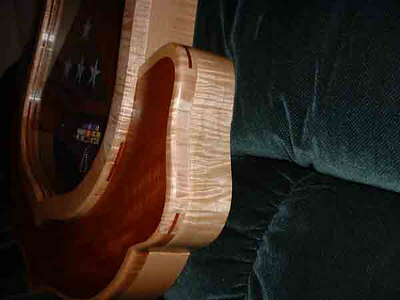 They are mahogany with inlaid maple strips and maple-splined corners. I'm matting all of the pictures in blue suede, since most of them are outdoors and feature water and sky. 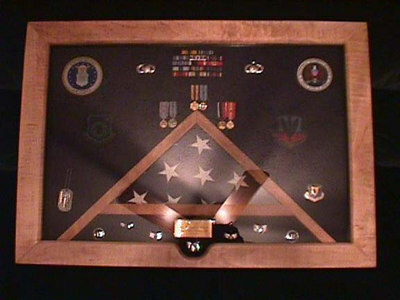 This shadow box was a Christmas gift to my father. It was my first bentwood lamination project. 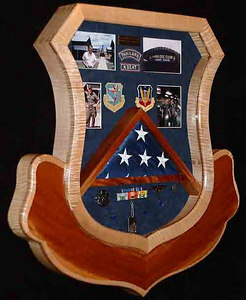 It was the most challenging project I took on to that date, and perhaps the most challenging yet. 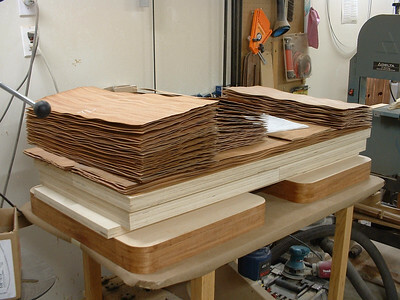 The woods are curly maple, and figured mahogany. 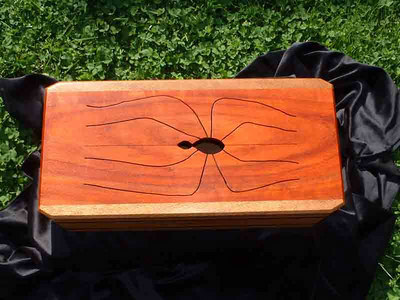 I made this jewelry box as a 10th Anniversary gift to my lovely wife. 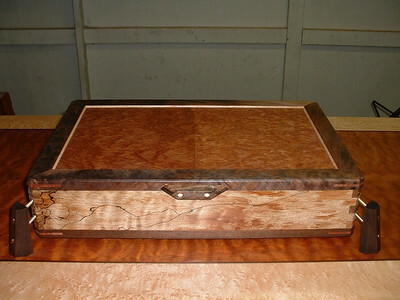 The lid is bookmatched redwood burl veneer. 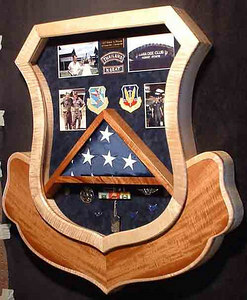 The frame around the lid is from a "crotch" section of California black walnut and splined with redwood. 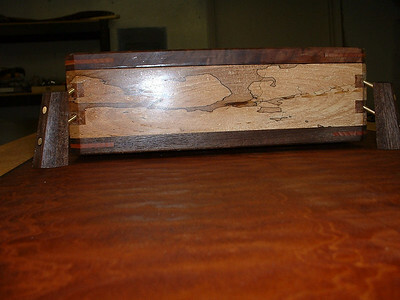 The case sides are spalted maple, and the bottom frame and feet are peruvian walnut. The pins are brass. 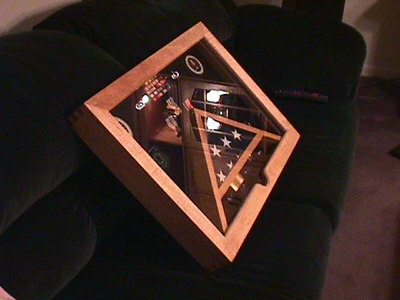 The jewelry box is sitting on top of the TV stand I built, in progress. If you look closely, you can see where the side split as the piece was fed through a wide belt sander in an attempt to flatten it. Spalted maple is a finicky wood. It is basically half-rotten. I managed to salvage the piece with epoxy, sawdust, and patience. 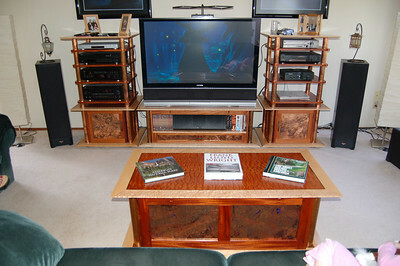 Here is the furniture I built to replace that Oak entertainment center. 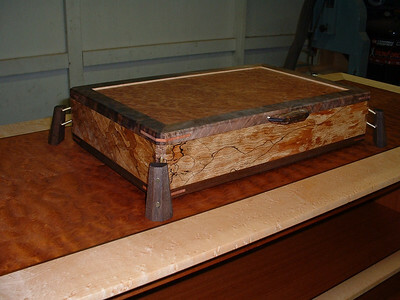 The woods I used are mahogany, birdseye maple, quilted mahogany veneer, and a little bit of peruvian walnut. I also incorporated copper pipe with a hot patina, and notan guilded copper panels with a cold patina treatment. 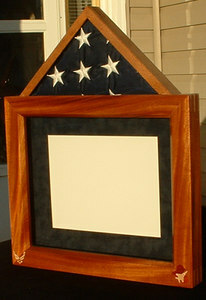 Here is my first project using my veneer press. 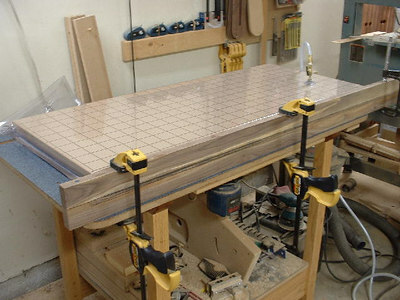 Many thanks to Joe of joewoodworker.com and veneersupplies.com for the assistance in building the press, instruction on veneering, and the quality veneers.